Welcome back to the occasional link collection we here at IMTFI call the Funny Money Roundup. 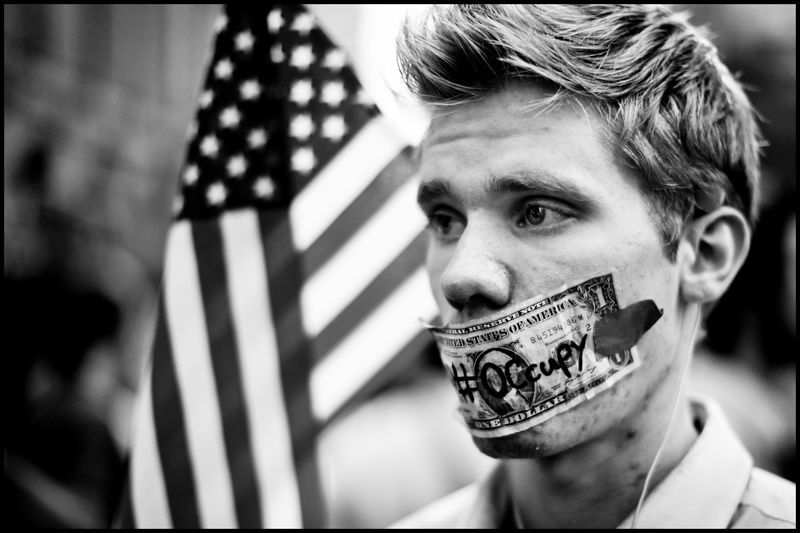 This installment focuses on the Occupy movements that have sprung up around the United States and around the world over the past several months. Part 1, below the break, shares links from our archive on the Occupy movements. Part 2 will look at the recession and Wall Street generally. As always, what follows is idiosyncratic and incomplete. If you’d like to share a link or several, please send them to Taylor Nelms at tnelms@uci.edu. Since the original occupation focused on Occupying Wall Street, there has been a lot written about the Occupy movements—too much to compile into any kind of archive, although see this sociologist's overview of the media coverage (h/t Paul). There was the original backlash, in which Occupy protesters were characterized as disorganized, unfocused, even childish. Then there was a backlash to the backlash, in which mainstream media outlets were accused of offering only back-handed coverage of the movement as it first emerged, developed, and spread. But there have also been reports who, exactly, is showing up to the Occupy Wall Street protests, as well as accusations of exclusionary practices (h/t Paul). There have been attempts to understand the underlying organizational principles orienting the Occupy encampments, epitomized in the General Assembly governance structure. (See, in particular, this quick guide on the General Assembly written by the Commission for Group Dynamics in Assemblies of the Puerta del Sol Protest Camp in Madrid [h/t What is the what? ]; this tutorial on the movement's "human microphone" tool and its shared gestural language [h/t Paul], for the view from the mainstream media, this take from NPR’s Planet Money team.) Are the Occupy movements, as The Economist suggests, a “leaderless, consensus-based participatory democracy?” Or, as Matt Stoller writes, a “church of dissent” or an endorsement of a kind of “anti-politics?” Perhaps an attempt to “occupy an abstraction,” as McKenzie Wark proposes. There have been comparisons between the Tea Party and the Occupy movements (although, then again ...) and attempts to situate OWS within the history of protest—including violent protest—on Wall Street and to trace the movement's intellectual roots. And there have been suggestions that the movement will be defined by its use of social media and the Internet, especially through the proliferation of memes. At IMTFI, we’ve become interested in the various competing discourses—especially the visual ones—swirling around the protests and occupations. 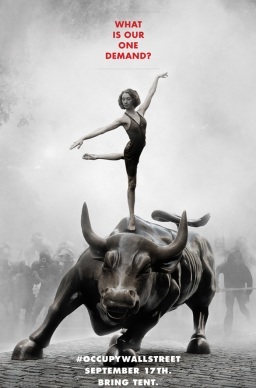 • Anyone interested in the visual culture of the Occupy movements should start with this primer, written by friend of IMTFI Lana Swartz and Dr. Allison Trope, a PhD student and Clinical Associate Professor, respectively, at the Annenberg School at USC. Swartz and Trope examine hashtags, "culture-jamming," and the various targets of the movements' visual rhetoric, and identify several important tactics (including the use of faces, ready-made sign templates, and the diverse use of multiple media to make the occupation visible). 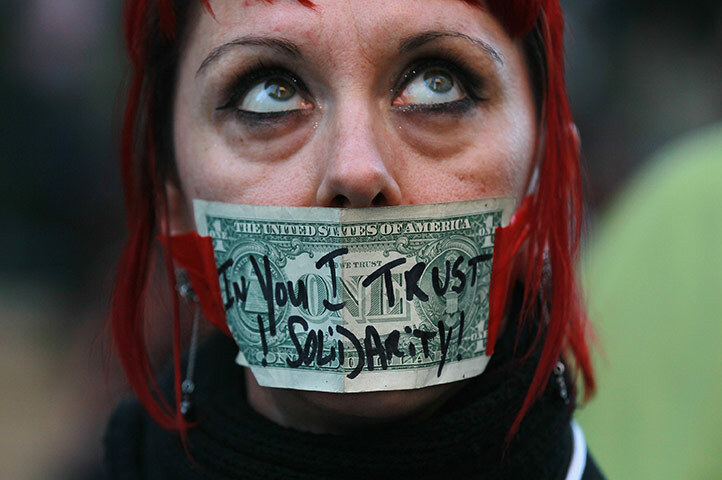 • For obvious reasons, we have kept track of Occupy imagery making use of cash, especially the Occupy George group, which “makes money talk” by stamping messages in red ink about wealth disparity onto $1 bills. • Artist William Powhida's exhibition of charts, rants, and word-images—all "Derivatives" of one sort or another—captures some of the affect of the Occupy movements: the anger, confusion, and exasperation. The handwritten declamations on notebook paper also echo the confessions of the 99% on the "We are the 99%" blog, not to mention the protest signs themselves. • For more on the "mood" animating Occupy, see also this nice take from Zuccotti Park that mobilizes a metaphor from chess to suggest feelings of apprehension, resignation, surrender, and despair. Zugzwang is a term used in chess to refer to a position where every move you have is a bad one. [...] A growing number of people in America know what it feels like to be in zugzwang. For some of them their whole life has been one long zugzwang, they can’t remember ever having any good options. Without catching a lucky break, a lifetime of hard work for most people results in just that—a lifetime of hard work. For others they maybe once thought they had it all—a good job with a pension, a nice house with a payment they could afford, set for life. Then in an instant it all disappeared. House is underwater, ARM is popping on the loan, pension fund bought a bunch of mortgage-backed securities. All that’s left is utter, hopeless zugzwang. Sadly this, if nothing else, is what unites us. This dreadful unease. This feeling that every option we have is a bad one. And this resentment we feel from being told that it has to be this way, that there are no other options, because these are the rules of the game. Alongside the discursive field that has emerged in conjunction with the Occupy movements, we are interested in the organization of the movements, especially at it touches on issues of funding and payment. • For an early look at the Occupy Wall Street camp at Zuccotti Park, see this post by sociologist Jennifer Lena. 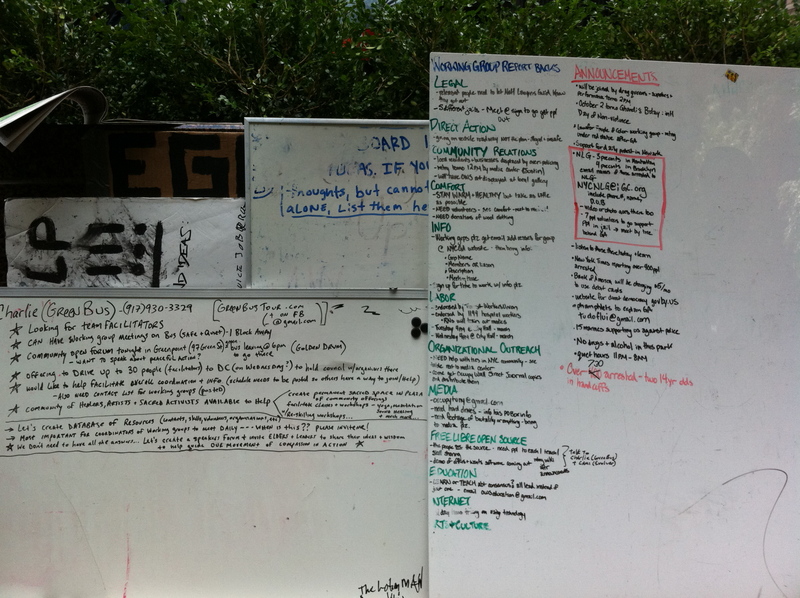 (h/t Paul) Lena’s photo of the camp's dry erase board captures the complexity of camp organization. I now understand a little better what it means for a protest movement to be without "a traditional narrative arc," to be "the product of the decentralized networked-era culture," to be about "inclusion and groping toward consensus." I now see how Occupy Wall Street is like the Internet—and that parts of this protest movement would be impossible without it. • There have been a series of articles on the libraries of various Occupy encampments. See also the Occupy Wall Street Library blog, as well as this essay from Inside Higher Ed about the intersection of libraries and the Occupy movements. • Also check out the various smartphone apps catering to the Occupy movements (h/t Paul), as well as this report on the emergence of an Occupy movement in the virtual World of Warcraft. • Finally, we’ve also been closely following the press on our colleague David Graeber, who has been hailed as one of the original organizers of Occupy Wall Street. And be sure to check back for Part 2, in which we share links on the recession and Wall Street!